While both manual and electric toothbrushes work well at removing plaque and tartar buildup for our Newport Beach patients, they each have their ups and downs.? If you?ve been thinking about buying an electric toothbrush, here are some pros and cons to consider when comparing the two. Each product has some of the benefits the other doesn?t. This list should help our Newport Beach dental patients decide which one is right for them. Easily accessible: You can buy a manual toothbrush just about anywhere, even at a gas station. Not saying they are all good quality, but you can get them anywhere! Inexpensive: After all, who can complain about a product that can ultimately prolong the life of your teeth and only costs a few bucks. 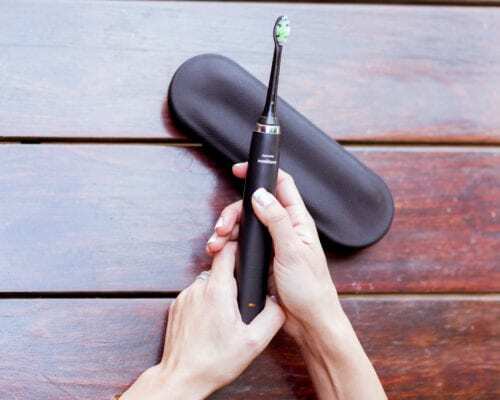 Better clean: The vibration and/or circular motion that?s given by an electric toothbrush is proven to provide a more thorough clean than a manual brush. The right amount of pressure:?All you have to do is simply hold the toothbrush lightly in your hand and glide it around your mouth. The right amount of pressure is placed on your teeth and gums, preventing damage. Good if you have limited dexterity: Since the electric toothbrush does most of the work for you, it?s easier to use than a manual toothbrush for people with carpal tunnel and arthritis. Increased awareness: When a person goes the extra mile to get an electric toothbrush, they become more aware of their brushing techniques. Paying attention to how you?re brushing your teeth can really improve the results you get. Timers: To help increase awareness and ensure that you?re brushing as long as you should, most electric toothbrushes have built-in timers. The mouth is divided into four quadrants, each of which should be brushed for 30 seconds. ?Some powered toothbrushes will beep or signal you somehow after each 30-second interval, telling you to move on to the next quadrant, then automatically shutting off after 2 minutes. Helpful Apps:?Yes, you read that right. This day in-age, powered toothbrushes often come with their own app. With children, they can have a fun, interactive experience and learn how to properly brush their teeth. Parents can keep track of their child’s brushing sessions. Adults that use the app for themselves can be reminded when it?s time to change their toothbrush head or alerted if they?re brushing too hard. With all great things come some not so good things. ?Here are the negatives to having each product. Can be difficult to maneuver: Some manual toothbrushes have large heads that are hard to get into the back of your mouth, making it almost impossible to brush all areas. Brushing too hard: It?s a common misconception that the harder you brush, the cleaner your teeth will be. The tips of the bristles are what does the cleaning. ?When you bear down on a toothbrush, you?re essentially brushing your teeth with the sides of the bristles. ?This leads to poor results, and loss of enamel. Improper bristles: You should only use a soft or extra-soft bristled toothbrush, but many of the manual options sold in stores are made of medium or stiff bristles, which can damage enamel and gum tissue. Costly: Depending on what you?re looking for in an electric toothbrush, you can be looking at anywhere from $5 to $300. 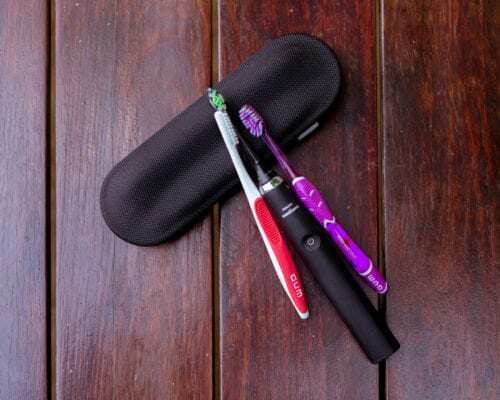 Can be a pain to travel with:?While most electric toothbrushes can hold a charge for several days, if you?re going to be away from home for a longer length of time you?ll likely need to charge your toothbrush. Meaning, you?ll have to pack and lug around your charger and charging station. Furthermore, if you?re traveling out of the country, the type of electricity available may not be compatible with your charger. ?WITH THAT SAID, companies like Sonicare and Oral-B have incorporated an easy way to travel with their toothbrushes. ?And the newer models even have the chargers attached the the case and plugs into any USB cable, so traveling is easy! Oh and an added bonuses is that both of these brands allow the case to hold 2 toothbrush heads, so if you’re traveling with a partner, it’s that much easier! Vibration: Electric toothbrushes vibrate (Sonicare) or spin (Oral-B) to clean. This is sometimes ticklish, messy, or bothersome to certain people, but most of the time you get used to it.? Some folks don?t like it at all and refuse to use an electric toothbrush for this very reason. Finding replacement heads: With powered toothbrushes, the head comes off so that it can be tossed out when needed. Some manufacturers want to make sure that you only buy their product so there may not be other compatible heads available to fit your base – meaning you have to buy replacement heads only from them. Don?t Forget a Cleaning with Your Newport Beach Dentist! Regardless of how much you spend on your toothbrush, or how often you brush your teeth, there will always be some plaque left behind on your teeth.? Once the plaque hardens and turns to tartar buildup, it?s nearly impossible for a toothbrush to remove it.? This is why it?s so important to visit our Newport Beach dentist regularly.? Having a professional cleaning at least twice per year will keep your mouth healthy. 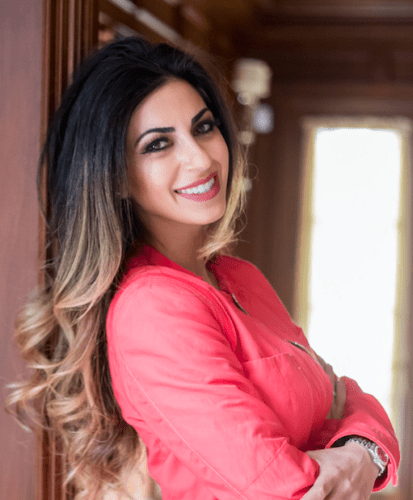 Dr. Desiree Yazdan and the rest of the friendly staff of The Center for Restorative & Cosmetic Dentistry are the top trusted dentist in Newport Beach, CA. We look forward to meeting you and helping take care of your teeth for years to come! Call us today.